Thinking of drawing some Christmas bells for this Christmas? 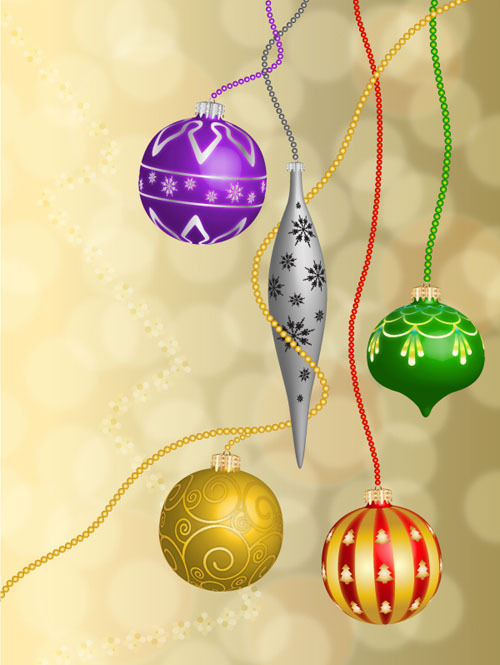 Read this illustrator tutorial to learn how to draw 5 different styles of vector Christmas bells using the 3D Revolve Effect. 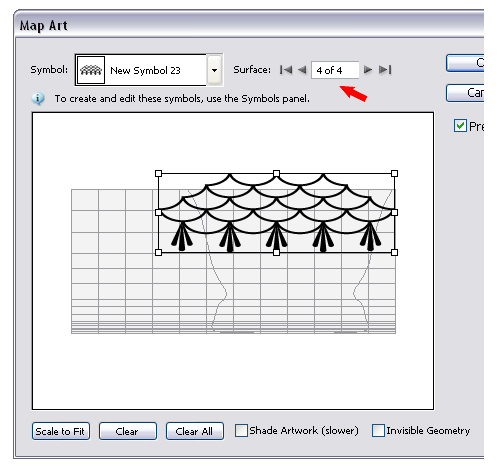 You will also learn how to create unique designs for each one and how to apply them using the Map Art option. This tutorial is creative and hope you will learn new techniques. Let’s get to work! 1. 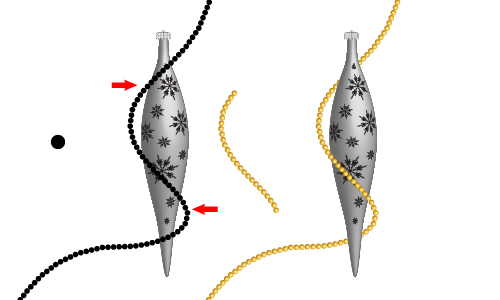 The first thing to do is to draw the outline of half of a Christmas bell so that you can apply the 3D effect. 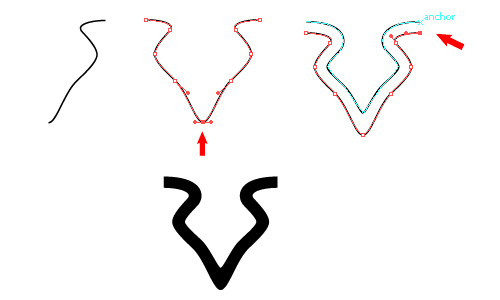 Take the Pen Tool and draw the path in the image and give it a 0.5 pt Stroke using red (R=252, G=2, B=14). You can also start from a circle, delete the left point and then modify just the top portion of the path to create the “neck” of the bell. 2. 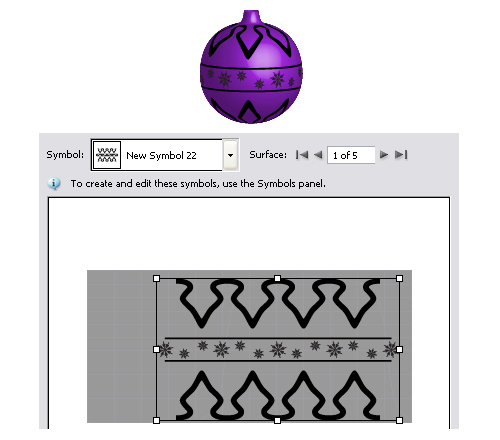 To create the design for the red Christmas bell, use the Rectangle Tool to draw a long rectangle that should be bigger than the bell. 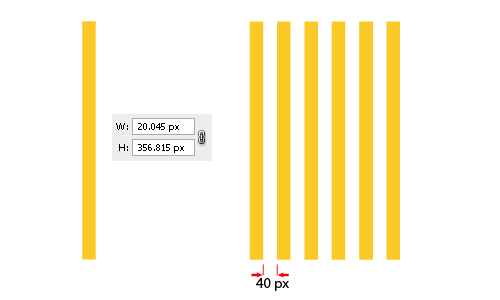 You can see in the image below the exact dimensions shown in the Transform Panel if you need them. The color is not important at this point so you can choose what you want. Copy and Paste in back the rectangle then use the right arrow key on your keyboard to move it by pressing 40 times. My keyboard increment is set to 1 px. You should have 6 stripes in total having equal distance between them. 3. 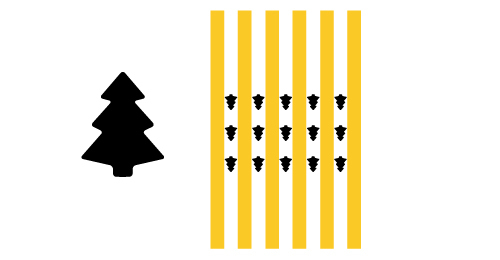 Next draw a simple Christmas tree shape, multiply it and place them all between the stripes, in the middle. When you are done group all the shapes and drag them into the Symbols Panel. 4. 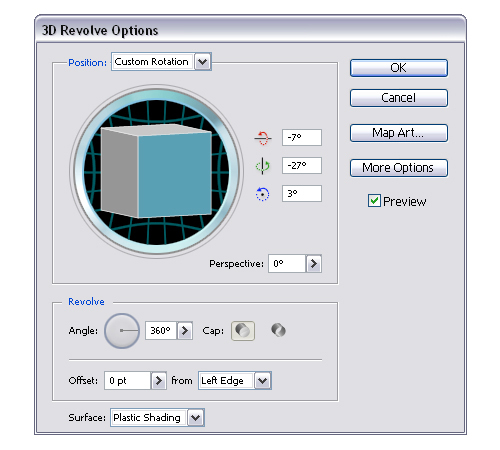 To apply the design on the Christmas bell double click on the 3D Revolve Effect applied in the Appearance Panel to open the 3D Revolve Options window then click the Map Art button. Select the front surface of the bell (mine was 1 of 5) and then select the symbol defined earlier. Move the symbol or scale it if needed depending on your bell size. 5. You can see in the image below how the red bell should look at this point and if you are happy with it go to Object and Expand Appearance. Navigate between all the shapes that are there in the bell’s group after expanding, find the stripes group and fill it with Gold Radial that you can find in the Swatch Libraries Menu > Gradients > Metals. The Christmas trees group if filled with a radial gradient using the following colors: (R=244, G=232, B=217), (R=237, G=208, B=137) and (R=191, G=131, B=41). 6. 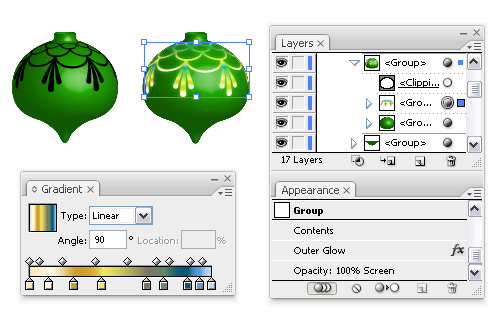 Now select the stripes group again, go to Effect > Stylize > Outer Glow and apply the next settings to give it a glowing look. Color used is yellow (R=251 > G=201 > B=38). 7. To obtain the next bell draw the path from the image below and stroke it with green (R=33, G=169, B=2) then apply the 3D Revolve effect with the same values like in the image at step 1. 8. 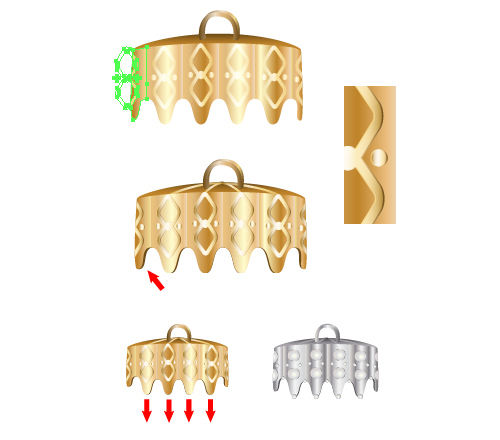 Here is how to draw the design for the second Christmas bell. Draw an oval shape using the Ellipse Tool, give it a 3 pt black Stroke, multiply it 2 times and place them like in the image. Select all of them and click Subtract from shape area and Expand to obtain the shape in the right. Now duplicate this shape, select it then switch to the Direct Selection Tool and by holding the left side point move it and only release when it intersects the other shape’s side point. For this you should have the Smart Guides on in the View Menu. Continue to do this and all the shapes will fit perfectly. When you are done select them all and click Add to shape area and Expand. 9. Next draw a straight path and give it an 8 pt black Stroke, Expand it and then select just the top point using the Direct Selection Tool and press the Delete key. Now select the other 2 top points and move them closer to each other. Make 2 more copies, scale them a bit and place them like in the image below. 10. Group all the 3 shapes made above. Duplicate them and place them like in the image. Just like you did before drag all the shapes into the Symbols Panel. 11. Select the green bell and open again the Map Art window then select the front surface and the symbol from the list. Move the symbol to arrange it and when you like how it looks on top of the bell go to Object and Expand Appearance. 12. Navigate again between all the shapes in the green bell’s group and find the one in the image. Fill it with a gradient called Colored Chrome. The graident can be found in the Swatch Libraries Menu > Gradients > Metals. Just change the angle to 90 degrees and set the Blending Mode to Screen. 13. 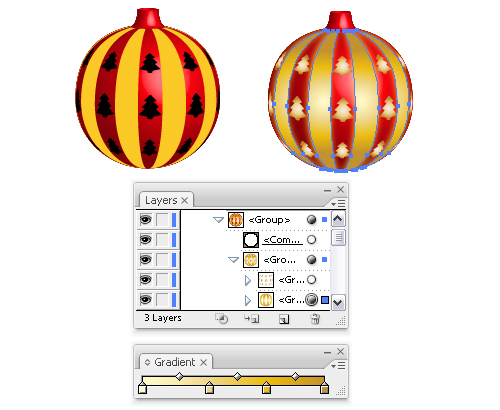 Also for the same group apply the Outer Glow Effect again with the next values. The color used is green (R=39, G=197, B=2). 14. Start by using the Spiral Tool to draw the first spiral, multiply it then rotate and place all the others like in the image below. Scale one of the spirals to obtain a smaller one, multiply it and place them between the bigger ones. The big spirals have a 3 pt black Stroke and for the smaller ones set a 2 pt Stroke. 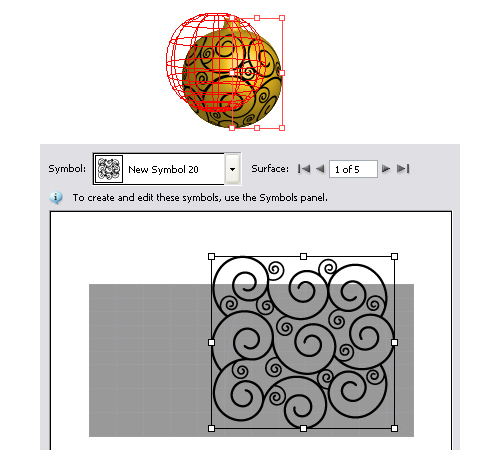 When you are done select all the spirals and click Add to shape area > Expand then drag it into the Symbols Panel. 15. Copy the red Christmas bell made at the beginning, change the Stroke color to yellow (R=251, G=201, B=38) to obtain the golden bell. Apply the symbol on top of it just like you did for the other ones and Expand Appearance when you are done. 16. Find the group of spirals and fill it with a gradient called Gold Radial and apply the following Outer Glow Effect settings. Use black color for the Outer Glow this time. 17. This bell is the easiest and here is how to make it. First draw the path from below and Stroke it using a light gray (R=204, G=204, B=204) then apply the 3D Revolve Effect with the same values like before. 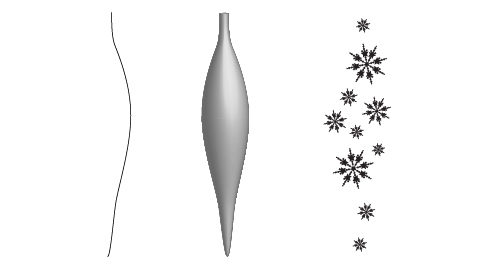 To create the symbol I used a snowflake shape made from many little stars but you can use any other snowflake shape if you want or if you have another one. 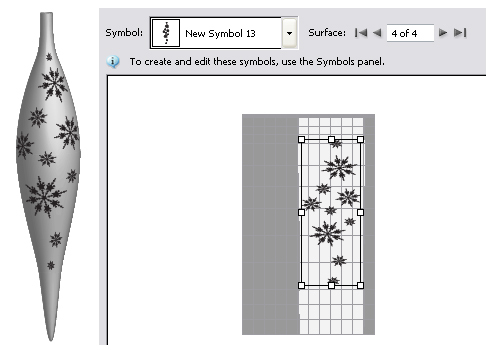 Multiply it and scale it to create the other ones then group them all and drag them into the Symbols Panel. 18. All that is left to do is to use again the Map Art option like for the other Christmas bells and you are done with it. 19. 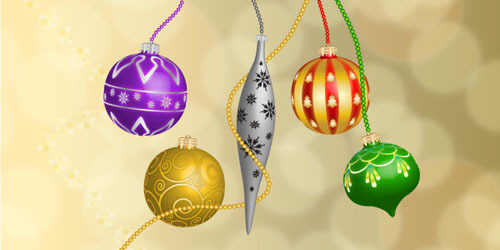 The last type of Christmas bell is the purple and silver one. I will explain how to draw the design for it. Take the Pen Tool and draw a path like the one in the image below then go to Object > Transform > Reflect and select Vertical. Now select just the bottom points using the Direct Selection Tool, click Ctrl+J and select Smooth to join the points. Scale this path to obtain the smaller one then use the Pen Tool to close the right end points of the 2 paths. Do the same to the left side. 20. Next multiply the shape and arrange them next to each other by intersecting the points like before at the step 8. When you have a row of 4 shapes, flip them vertically and place them like below. 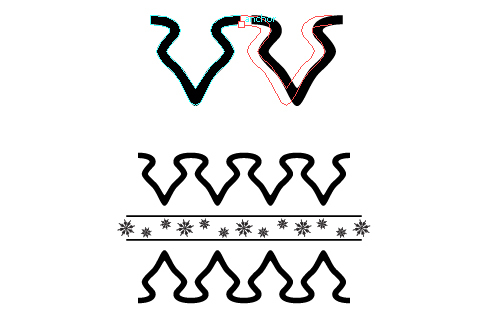 Also draw 2 lines between them using the Line Segment Tool or the Pen Tool and place some snowflake shapes that you used before. Group all these shapes and drag them into the Symbols Panel. 21. Copy one of the round bells and change the Stroke color to purple (R=157, G=39, B=218) then use the Map Art option again to apply the symbol. 22. Expand the Appearance and fill the symbol’s group with a Silver gradient. 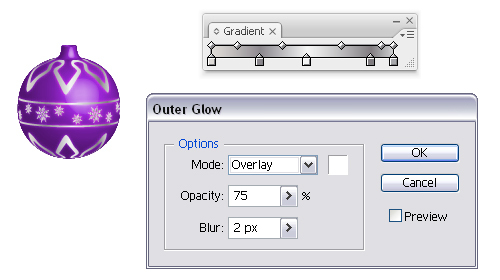 Apply the Outer Glow Effect using white and the values that you can see in the image. 23. Start by drawing a small rectangle then go to Object > Path > Add Anchor Points to obtain the 4 middle points. 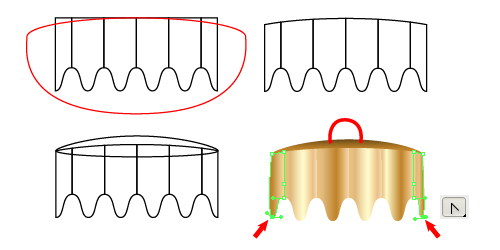 Next draw a curved path with the Pen Tool like the red one in the image, reflect it to the other side and join the bottom points (select Smooth). 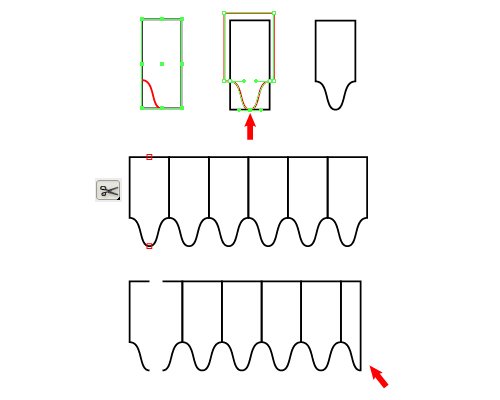 Continue to draw with the Pen Tool to close the path then select both the rectangle and the red shape and click Intersect shape areas and Expand. 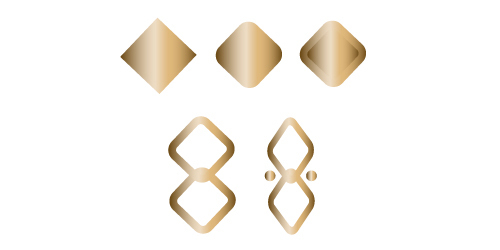 Multiply 5 times the obtained shape and place them next to each other like below. Use the Scissors Tool to cut the shape in the shown points and delete the left part. Close the open path using the Pen Tool and do the same to the other side. 24. Now we need to cut the top part of all the shapes made to make it look rounded. To do that, draw the red path that you can see below on top of them and Paste it in back 5 times, one for each of the other 5 black shapes. Select both the red path and one of the black shapes and Intersect shape areas and Expand. Do the same for the other 5 shapes. Next draw the other oval shape behind and color them with gold gradients. Use the Convert Anchor Points Tool to transform the shown points from corner to smooth and adjust the handles if needed. For the hanger, simply draw a curved path, give it a 2 pt Stroke, Expand it and fill it with a similar gradient. 25. Now we will make the cap piece look more original. Draw a square and rotate it 45 degrees then go to Effect > Stylize > Round Corners and set an 8 px Radius value. Select Expand Appearance and scale it to create the smaller one inside then select both and click Subtract from shape area and Expand. Duplicate it and place them like below then draw 2 small circles. Group all the shapes and make them more narrow using the Selection Tool. 26. Multiply the group of shapes made above and place them like in the image then change the Blending mode to Screen for all of them. The one placed on the side needs to be masked so use the side shape of the cap to create a Clipping Mask. Do the same to the right side. Copy and Paste in back all 6 groups of shapes, move them a bit to the right and set the Blending mode back to Normal (see the close up). Next Copy and Paste in back all the 6 cap shapes made at the step 24, click Add to shape area and Expand, move the obtained shape a bit to the right and change the fill color to brown (R=109, G=75, B=23). Draw some lightly curved paths on top, Expand them and fill them with a similar gradient. 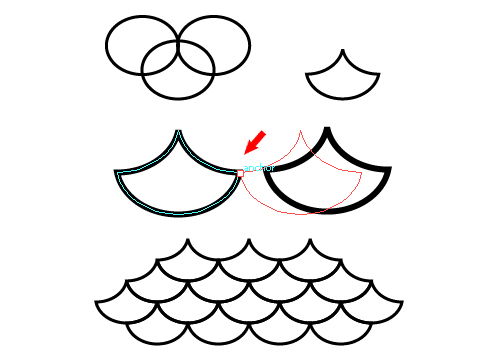 Also select just the bottom points of the 4 shown shapes and drag them a bit down but that is optional. I think it looks better. The silver cap piece is made in the same way, I just replaced all the shapes on top with circles. 27. Here is how to create the colored beads and how to make them look like they go around the Christmas bell. 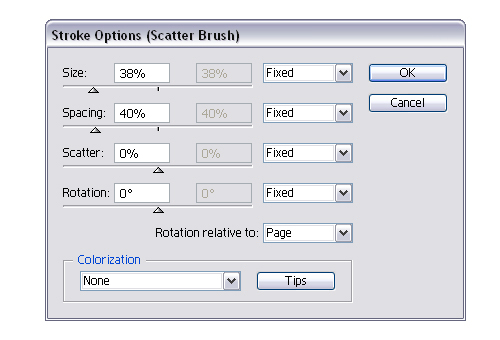 First draw a small black circle and drag it into the Brushes Panel and select New Scatter Brush. Draw a curved path and Stroke it using this brush like in the image. 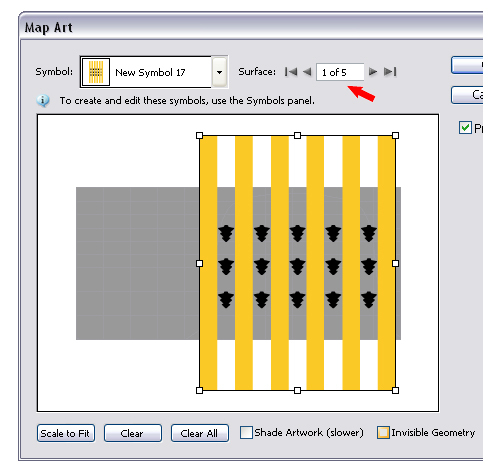 Double click on Stroke in the Appearance Panel to open the Stroke Options window and set the values you see below. Expand Appearance when you are done, Ungroup and select just the circles between the arrows, group them back and move them to another Layer above the Silver Christmas bell, all the other ones should be behind it. 28. Fill the beads with a radial gradient using the following yellow tones: (R=255, G=251, B=204), (R=238, G=214, B=136), (R=235, G=187, B=16) and (R=191, G=131, B=41) that you can see in the image at the next step. 29. You can see here all the radial gradients used to fill the beads. For the red beads colors used are: (R=251, G=201, B=38), (R=252, G=2, B=14), (R=178 ,G=1, B=4). For the green beads: (R=251, G=201, B=38), (R=39, G=197, B=2) and (R=13, G=107, B=0). For the purple beads: (R=255, G=255, B=255), (R=183, G=45, B=254) and (R=118, G=14, B=152). For the gray beads: (R=255, G=255, B=255) and (R=26, G=26, B=26). The work is done and here is the final image with all the Christmas bells made. Hope you enjoyed learn something new in this illustrator tutorial. This is a really nice tutorial. Thank you so much for this! Funny, I have a similar tutorial prepared for my website. Funky tutorials! True very heavy. Necessarily do his today evening! Really nice xmas balls. I like it! 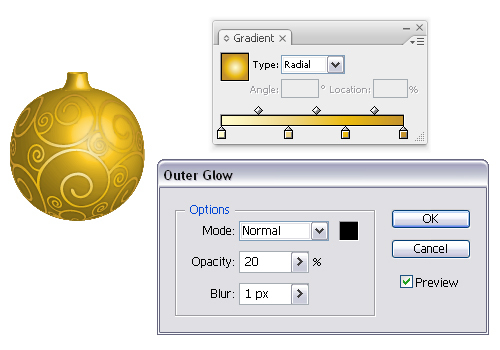 Thanks for the gorgeous Christmas bauble tutorial designs.. really must use the Illustrator symbols map art feature more, inspiring stuff. If you can’t then after Expand Appearance, go to Object menu and Ungroup and you should be able to select the group of stripes with the Selection Tool. In the text I didn’t said to Ungroup so in that case you have to navigate using the Layers Panel to find them. I’m impressed! Extremely useful info specially the last part 🙂 I take care of such information much. I was seeking this certain information for a very long time. Thank you and good luck.